Saffiano Leather. Goldtone pyramid studs roughen the put-together profile of this compact crossbody bag. The rich leather construction ensures durability. 22" to 25" crossbody strap drop. 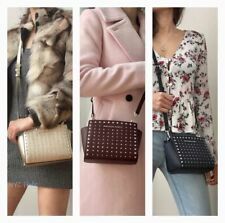 Adjustable and detachable crossbody strap. New with tags 100% Authentic. Comes with everything pictured. Payment due within 24 hours of auction end. No international shipping, sorry. W/ adjustable 22” chain links & leather crossbody strap. Floral Embroidered studded Soft leather. Inside Bag: 3 Credit Card Slots. Color: Black. STYLE: 35H8GO5C1L. Gold-tone hardware. MICHAEL KORS Selma Mini Saffiano Leather Crossbody. Used maybe twice still looks brand new can’t even tell it was used. Has adjustable removable strap. Condition is Pre-owned with defects from use. Hence, low price. Zipper closure. Leather is good overall. A lot of life left to this. 13" wide. 10" high. Composition: Saffiano Leather. Details: saffiano leather,zip top fastening, gold-tone hardware. removable & adjustable leather strap for shoulder or crossbody. wear, interior on zip and one open pocket, fabric lining, logo details. W/ adjustable 22” chain links & leather crossbody strap. Floral Embroidered studded Soft leather. Color: Ballet Pink. Top Magnetic Snap Closure. Inside Bag: 3 Credit Card Slots. Gold-tone hardware. This beautiful Selma crossbody is designed in a structured silhouette crafted from luxe Saffiano leather and finished with our distinctive logo detail. • 100% Saffiano Leather. • Zip Fastening. • Lining: 100% Polyester. Saffiano Leather. Silver Tone pyramid studs Accent the winged profile of this compact crossbody bag. without overwhelming it, The rich Structured leather construction ensures durability. 22" to 25" crossbody strap drop. KEY KEEPER HOOK WITH LEATHER LEASH. 19 1/2" DROP ADJUSTABLE, REMOVABLE SHOULDER STRAP. TOP ZIP CLOSURE, MK LOGO LINING INSIDE. INSIDE ZIP AND MULTI FUNCTION POCKETS. GOLD TONE HARDWARE/ULTRA PINK. DOUBLE HANDLES WITH 4" DROP. Color: Navy blue gold tone hardware. I do putcolor of bag so that you can search on line to see bag and get a feel for whatcolor the bag might be. Upon receiving the bag it may be differentcolor either lighter or darker. Michael Kors Selma Satchel Bag - Blue Saffiano Leather. Condition is Pre-owned. Shipped with USPS Priority Mail. 100% authentic MK handbag. Dust bag not included. • 100% Saffiano Leather. • Top-Zip Fastening. • Lining: 100% Polyester. • Interior Details: 3 Card Slots. 22"-24" Adjustable Crossbody Strap. Black with Red Rose Pattern Overlay. Gold Tone Hardware. Signature Printed PVC with Saffiano Leather Accents. Interior Zip Pocket. (Before 2-3pm EST). 11.5"L X 6.5"H X 4.5"D.
Great crossbody bag is in excellent, new condition. Strap is adjustable so should work as a cross body for every body type. THIS VERY SPECIAL. STUNNING AND LUXURIOUS! LEOPARD AND LEATHER FUR. CHARM PURSE. PURSE WAS MADE IN SMALL, QUANTITIES AND IS RARE AND HARD TO. IT'S THE PERFECT SIZE TO TAKE. IN AND DOES NOT AFFECT THE BEAUTY OF THE PURSE. MICHAEL KORS Color Block With Silver Hardware. Condition is Pre-owned. Shipped with USPS Priority Mail. The inside shows signs of wear and a few small stains but is in overall fine preowned condition. • Interior Details: Zip Pocket, 2 Open Pockets. • 100% Saffiano Leather. • Adjustable Strap: 17.5"-19.5". Purse is in excellent condition. The size is a "mini". Kept in dust bag. 7" tall, 4 1/2" wide, 8 1/2 long. I will never intentionally misrepresent anything I have listed. 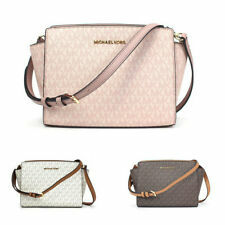 Michael kors selma leather handbag crossbody medium. Condition is Pre-owned. 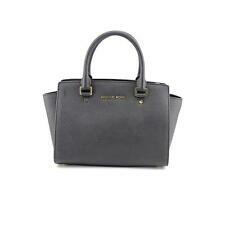 Michael Kors Selma Purse Large Navy Saffiano Leather . Condition is Pre-owned Shipped with USPS Priority Mail. Stains on the bottom. side to side: 13". Gold Tone Hardware. Interior Zip and Slip Pocket. Removeable / Adjustable longer Strap. Color: Black. Condition is Pre-owned. NOT RASPBERRY COLOR AND NOT PINK ON THE INSIDE. THE ITEM FOR SALE IS THE ONE IN THE PICTURES. MK Signature Rose. 1 Slip-in Pocket, 1 Zipper Pocket. Strap:4.5", 19". The pictures look larger than the bag . Zip Top Closure. 11"(top) 9"(bottom) x 7" (H) x 3"(D). Gold Toned Hardware. 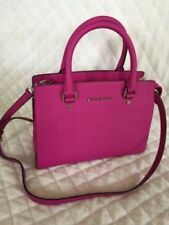 Store style# 30T4MLMS2T Michael Kors Selma Medium Leather Satchel. Really good conditions. Condition is Pre-owned. Shipped with USPS Priority Mail. Saffiano Leather. -Detachable Shoulder Strap. -Interior Zip Pocket. -Fully Lined. 01 zip pocket. Double Rolled leather handles with 6" drop. 01 inside open pocket. Adjustable, detachable Leather shoulder strap with 20" drop. 42" adjustable leather shouder strap with 18"-22" drop. Gold hardware. Details: saffiano leather with stud detailing at front,gold-tone hardware. Composition: 100% Leather. zip top closure, top handles, detachable and adjustable longer strap for. COLOR: Black. 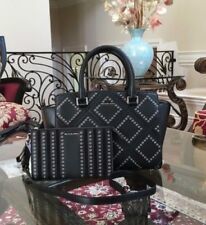 Michael Kors Selma Purse Large Black Saffiano Leather WITH FREE GIFT! Michael Kors Selma Medium Satchel AND WALLET!! !